The aim was to make up an exhibition format with low material costs and low use of space, to show graffiti-pictures. 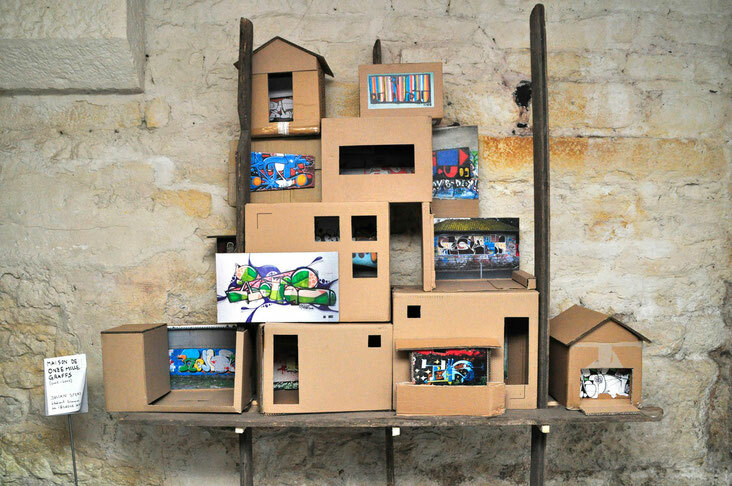 The maison graffiti – house of graffiti – evokes the improvised architecture of favelas or townships. The inspiration could have been the work "women are heroes" of the artist JR.
Das Ziel war es ein Format zu finden, in dem man Fotos von Graffitibildern mit einfachen Mitteln und auf geringem Raum ausstellen kann. Das maison graffiti – Graffiti-Haus – erinnert an die improvisierte Architektur von Favelas oder Townships. Als Inspiration könnte die Arbeit "women are heroes" des Künstlers JR gedient haben.